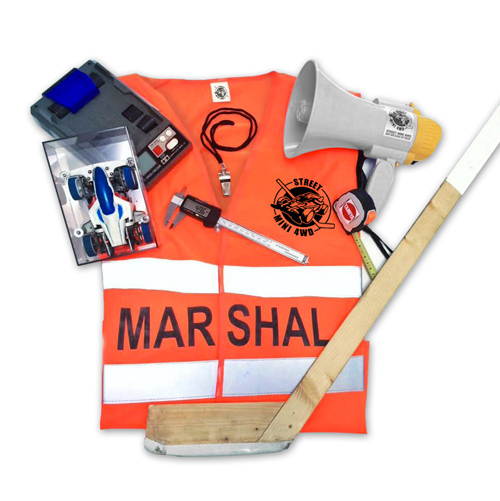 The race official (or "marshal") is the one who, with his presence, guarantees the correct development of the Street Mini 4WD event. He is required to behave with principles of education, respect for the racers and the dignity of his role. To gain the role of "race official" there is a need for some preparation and having participated in at least one official Street Mini 4WD event. Any other instruments for arbitrage (eg whistle, megaphone). Supporting race judges: they are optional figures who have the task of establishing the start of a race with a countdown ("3, 2, 1, Go!") and eventually define the conclusion of a race (example: waving a checkered flag).